A while ago, I posted some pretty pictures of my toe when I figured out the image format used by the Digital Persona and Microsoft fingerprint readers. While it’s pretty cool to see your fingerprint on-screen, the real question is how do we make use of these prints? We need a way of storing fingerprints, and a way of saying “does this fingerprint equal the one we stored earlier?” From that point, we can implement fingerprint-based login and other things. There are various open-source projects aiming to do this kind of thing, I made a list of them here. Unfortunately all of them appear to be dead projects and most of them aren’t useful at all, but I’ve made progress with one of them at least: FVS. There are various different algorithms which can be used to compare fingerprints. I’ll try to describe the method used by FVS: minutiae detection. 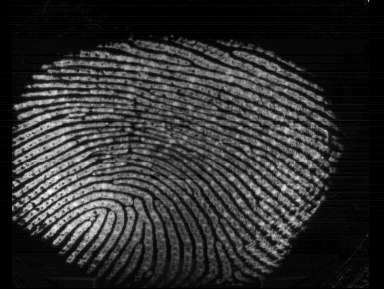 A fingerprint is made up of ridges, basically just the curvy lines which you see. Ridges start and finish, and some of them split (bifurcate) into 2 other ridges. The points where ridge endings and bifurcations happen are known as minutiae. We can compare the positions and directions of the minutiae on two fingerprint images to decide whether they are equal. This is certainly throwing a lot of information away, but this method is very widely used in the fingerprint recognition world. We start with the initial toe-print. I actually cheated by subtracting an image seen by the sensor before I scanned my toe from the toe-print, so what you can see below is slightly enhanced (clearer) than the original image. The above enhancement takes a few seconds on my system. This is OK for prototyping but is too slow for a real fingerprint login system, I hope we can find ways to optimise this. In addition to the Gabor filter, the image was further enhanced by binarization: all pixels are either black or white, no noise. The ridges are now shown in black on a white background. The next step is to reduce each ridge line to a single pixel in width. This is known as thinning. The advantage of thinning is that minutiae are now really easy to detect. We take every pixel on the image, and we ignore it if it is not a ridge (i.e. if it is white). For all the ridge pixels, we count the number of adjacent ridge pixels. If there is only one ridge pixel neighbour, we have found a ridge ending. If there are three ridge pixel neighbours, we have found a bifurcation. The code isn’t perfect, as it detected many minutiae around the edge of the fingerprint image, where they do not exist. However it should be relatively simple to exclude those as FVS already knows about the edges of the print. The next challenge is to compare two minutiae sets and decide how similar they are. FVS includes some code to do this, but it just crashes, and I haven’t spent much time debugging it yet. This is a difficult operation: prints of the same finger are never identical: sometimes some minutiae are not visible, they can be spaced slightly differently, and the finger might even be significantly rotated since the last print. A project called eFinger has built a complete fingerprint recognition database. It uses FVS’s enhancement code, but ships it’s own code for thinning, minutiae detection, and minutiae set comparison. The code is not brilliant (does not consider rotation or anything like that) but should provide a good starting point. This entry was posted on Sunday, August 13th, 2006 at 12:08 pm	and is filed under Fingerprinting, Gentoo. You can follow any responses to this entry through the RSS 2.0 feed. You can leave a response, or trackback from your own site. It depends how you look at it. Sure, this device sends your whole fingerprint over a wire, which someone could be sniffing, but similarly, someone could be sniffing your keyboard cable as you type in your password. That said, there are definite security issues with fingerprints and storing them. We leave them everywhere too. So while it may not be ultimately secure to replace passwords with fingerprints, maybe they could be combined so that a login requires a finger and a password. Maybe we could use the fingerprint to select the username. There are many possible uses. DSD, you rule! I have used and tested your stuff and its really cool. I have even tried to use the output as input to a Russian open source project for fingerprint matching, but so far with no luck, as it uses a raw scanner image (from a scanner I dont have) and wont accept any form of converted image (spent quite some time with ImageMagick, etc). So, I am – like many others – desperately waiting for your matching software code. It seems you are the only non-commercial biometrics wizard out there – and using Microsoft scanners – its beautiful! I need your algorithm to enhance the fingerprint image. would you mind to give it? thanks before! Hi Can i get your source code please? I really need it for a project. Please help me. Can i get your source code please? I really need it for a project for my students. Your help is very appreciated. I try build similary system in C++ language. I have fingerprint reader Fujitsu MBF200, I’m write driver to this device , and I can get fingerprint image and show it or write to file. Now I try enhancement this image, I work on it few weeks and nothing, I have’t got good algoritm, or I can’t interprete it. Can You help me? Please, even You can’t send me source code. Can You send me algoritm or just equations? I’m from Poland and in my country this problem isn’t know. I’m appologise for my language. I am sorry. I dont have such programs. I am working in other fields. Wish you good luck. In case I found any thing new , Then I will provide you with required material. I have fingerprint reader Fujitsu MBF200. Unfortunately I don’t know how to connect it to PC via USB. Does anyone has a schema with connection mbf-200 to USB? If you need to connect Fujitsu MBF200, you must download driver for it. Probably the best way to run this stuf you must download VeriFinger from “www.neurotechnologija.com/download.html”, it has got driver and trial program. kan i have your code for a project please? I need generalization process in fingerprint. i don’t know how to get common minutiae from images Does anyone help me? reader with my interface design.really need your help..
CAN U SEND ME THE CODE OF THIS PROJECT,,,THIS WILL BE BENIFICIAL FOR ME. Will U please give me its source code… It will be really helpful for me…. I need the code for this…. hi! thanks got i found you, i’m now working on my final year project and i hope you can send me the code for the fingerprint system..thanks in advance really appreciate if you can help me out..
i viewed your documentation and its really a good project. i am working on this project so can you please mail be your project for reference as this can be helpful for me to build my project. i’m trying to smoothing my binarized fingerprint image, but i got nothing. could you help me with smoothing the image? can you please tell me the source code for this project using matlab. i have done to match 1 to with many finger print in database ….